Producer Nicholas Weiller, known to millions as Bro Safari, continues to brand the industry with a searing impression of his hip-hop influenced trap and huge moombathon mixes, that have earned him his stripes alongside some of electronic music's biggest and best. 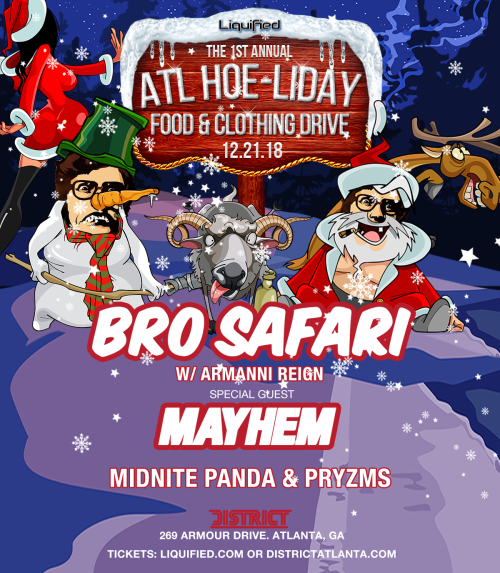 An avid punk rock fan that originally began producing drum n bass back in his hometown of Atlanta, he adopted the tongue-in-cheek demeanour of Bro Safari to launch his explosive foray into palpitation-inducing dubstep and bass-pummelling trap. Chart topping, dance floor rocking, and taste making come naturally to Atlanta based DJ and Producer Mayhem. With over 15 years in the studio and the decks, he has garnished the attention of the heavyweights in every genre of his focus. As of late his focus has been brought back to home on the forefront a movement combining Trap music with Dubstep, in addition to maintaining a healthy output of Drum & Bass, while working with Rap artists such as Tyga, Gucci Mane, Travis Porter, and Trouble.